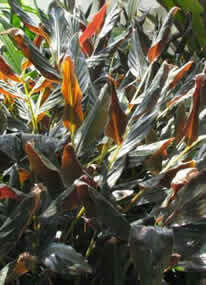 It has glossy dark brown to nearly black foliage. This plant has a compact growing habit to a maximum height of about a foot tall. It matures at 18' - 24' high with yellow flowers. It prefers part sun to shade. 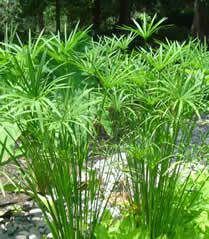 Excellent marginal plant with nice umbrella-like foliage. Alternifolius is an extremely fast grower that works great in ponds, watergardens, and containers. It matures at 4' - 5' high and prefers sun to part shade. This fragrant ginger looks like a dwarf bamboo bush. Great clumping habit! Perfect patio container plant. This planthis fragrant ginger looks like a dwarf bamboo bush. Great clumping habit! Perfect patio container plant. This plant will get 18" - 24" high and prefers sun to part shade. Elongated heart shaped 3"-5" leaves are bright green with silver patches radiating out from the center with a burgundy stripe down the middle.This plant matures at 5' -7' and prefers part shade to shade. The leaves are narrow with green and red mottling on the top and solid maroon coloring on the bottom. This plant will grow 5' -6 ' high and prefers sun to part shade. 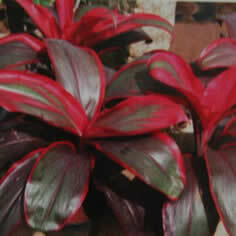 Has brilliant ruby red foliage mixed with dark burgundy. It has a compact habit with broad leaves. Makes an excellent container plant. This plant will grow 18"-24" high and prefers sun to part shade. Compact growth habit with a symmetrical appearance. Non-vining, self heading. 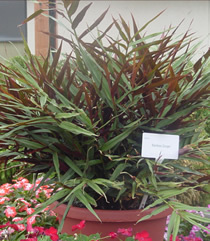 Foliage is dark green and has a waxed appearance. 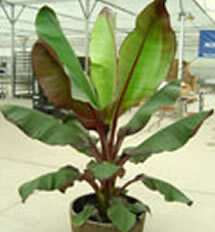 This plant grows 18"-24" tall and prefers part sun to shade. 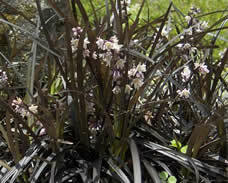 An attractive dark leaved, annual grass, clumping form with small white flowers and dark purple berries towards the end of summer. This part shade to shade loving plant matures at 10"-12"
Brilliant red coloring in leaves and midvien, excellent in large containers. This plant grows 5' -6' high and prefers sun to part shade.